Easily share and enhance your audience’s experience using important, up-to-date social media campaigns with UCView’s Twitter Content Widget. This innovative technology features several different eye-catching, visually stimulating options like modifying the look, color, and animation of the Twitter Widget. Showcasing social media campaigns through digital signage platforms have become powerful tools for engaging consumers over recent years. 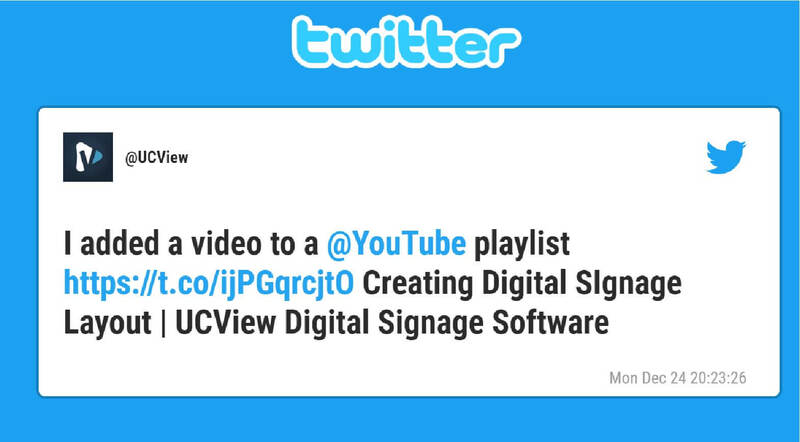 UCView’s free Twitter widget allows users to create tons of fun, unique, and informative messages through their Twitter account. This app allows for you to easily and effortlessly broadcast and interact with the environment in high-traffic areas. This platform not only allows for innovative interactivity with viewers, but also has measurability components, allowing the user to assess the impact and reach on its audience quickly and efficiently for future campaigns. This content app can be cropped to fit 4:3; this feed can be customized to fit any zone size except for the header and footer. This content is best shown in full-screen mode or in the main media section on a vertical screen. Animation is included with this app.